Ahhh to be a kid again! My title says and other stuff.....but I'm not sure what that other stuff is yet, so I will have to think more on that. I'm really loving my whole lack of content thing that is going on this year. Here is a story.... Katarina just discovered this week (thank you television) that you can say something and then follow it up with "Not!" and then laugh hysterically.....well she laughs hysterically......I sigh and roll my eyes and wonder why this particularly irritating idea is still roaming around on children's television since I thought that saying "Not!" went out around 1995. And then I come and say it on my blog. I think I need sleep! There it is folks....the "other stuff"! She's being retro! Love the pj's. Not sure where the NOT statement came from but yeah it's annoying!! NOT that I am saying your blog is annoying!! :) Haha!! Oh my gosh, gotta love when kids discover the "Not!" phrase! thank you so much for the support! i posted a link in my newest post to hopefully send some of my readers your way! i hope you come back next week (or daily) to check me out! thanks again! 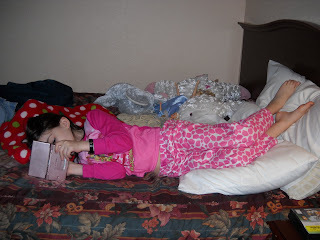 I love that picture of Katarina with her feet up on the pillow and her head on the blanket. I used to do that when I was a kid all the time....with my Atari....playing PingPong. No Nintendo DSs back then! I always hated the term "sweet!" and hoped it would fizzle out, but I still here people say it. I love your Project 365! Cool idea. I think I might try it too. NOT! Sorry, couldn't resist. I think saying "not" after a sentence came about around the same time as boys started wearing their pants so low that their underwear showed. I remember my son first telling me it was a new style and I thought he was joking! oh wait till they start talking to you in "texting lingo". Took me forever to figure out that IMB means I am back. He learned that one from TV too.